Hop on board the Spirit of Norfolk for a wonderful cruise ship experience that incorporates fine dining and great entertainment! Whether you're looking for a brunch, lunch, or dinner cruise, the Spirit of Norfolk has it all. Each cruise offers delicious food, wonderful sightseeing views, and a lively atmosphere. The Norfolk cruises are perfect for a romantic night out, a celebratory outing, or a weekend getaway. Choose the cruise that best fits what you're looking for, perfect for a Williamsburg, VA vacation! Your Spirit of Norfolk Brunch Cruise will sail for two relaxing hours along the Elizabeth River for a relaxing, casual experience. The ship includes three different interior decks with amazing views, dance floors, full-services bars, and an open-air rooftop deck. With the Brunch Cruise, you will have the opportunity to visit the omelet station where you can special order an omelet of your choice. Or, those guests who are 21 and over will receive a complimentary glass of champagne and can also enjoy the mimosa and Bloody Mary bar. Here, guests can personalize their mimosas with special juice and liqueurs and their Bloody Marys with a variety of vodkas and garnishes including celery, blue cheese-filled olives, and more! The Brunch Cruise includes breakfast pastries, fruit salad, scrambled eggs, bacon, sausage, potatoes, omelets, salads, and various entrees including salmon and tilapia, chicken parmesan meatballs, baked ziti, and roast broccoli. Those guests with a sweet tooth can also enjoy the dessert station including delectable treats such as cookies, brownies, and fruit. 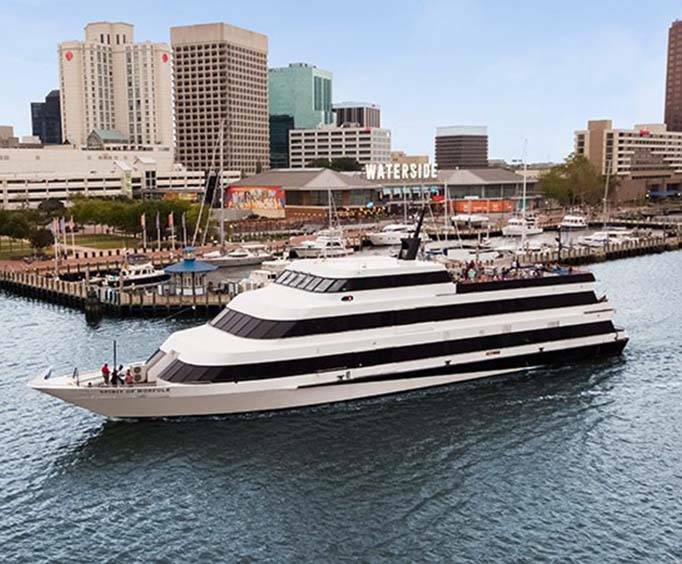 The two-hour Norfolk Lunch Cruise will take you along the Elizabeth River where you'll see major attractions like the United States Navy Atlantic Fleet. 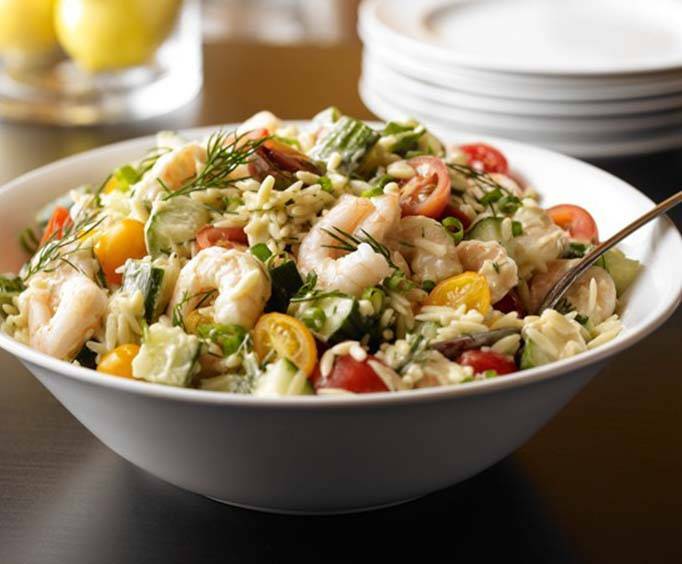 The casual Lunch Cruise includes a salad buffet, entrees such as salmon and tilapia, chicken parmesan meatballs, baked ziti, and roast broccoli. Top your meal off with a mini pastry, cookie, brownie, or fruit. 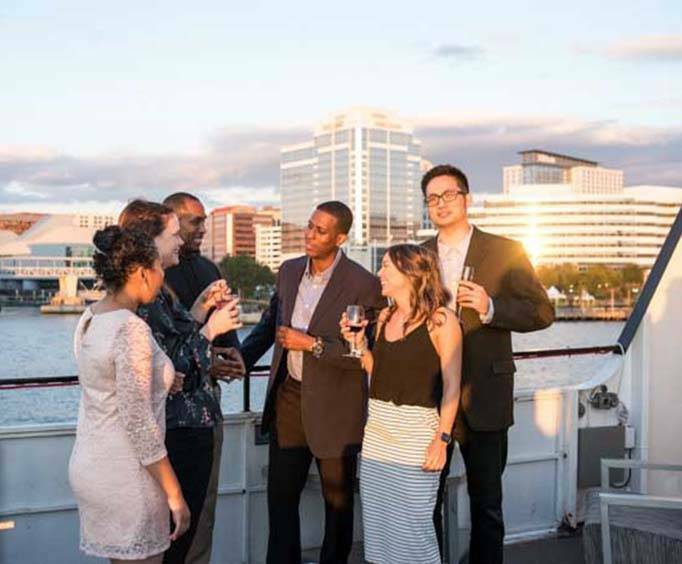 The Spirit of Norfolk Dinner Cruise is sure to provide guests with incredible nighttime views of the city's skyline. The Dinner Cruise is a fine-dining atmosphere and asks that you dress accordingly, with no jeans, t-shirts, or tennis shoes. This cruise is a dinner party on water with live DJ entertainment and a dance floor for anyone who wants to dance the night away! If you'd rather take in the sights, head out to the observation deck where you can relax and enjoy incredibly beautiful views. The Dinner Cruise makes for a romantic night out or a lively and fun experience. Cruise times will vary depending on the day you go, but range anywhere from 2.5-3 hours. The buffest-style dinner menu includes a variety of salads, roast salmon and tilapia, chicken parmesan meatballs, twice cooked beef short ribs, baked ziti, and roast broccoli. Don't forget the dessert! Enjoy a mini pastry, cookie, brownie, or fruit after your meal. Take a relaxing journey on Spirit of Norfolk Dinner Cruise where you can choose from the brunch, lunch, or dinner cruise. Each cruise takes you along the beautiful Elizabeth River where you can see some of the most visited attractions like the Norfolk Naval Base, Tanner's Point, and more. Don't miss this wonderful opportunity to see the area in one of the most unique and exciting ways! This is one of the most fun things to do in Williamsburg, VA.
What type of seating does Spirit of Norfolk Cruises Near Williamsburg, VA have? There is dining seating as well as seating on the upper deck. Paid parking garage at Town Point Garage or Main Street Garage. Approximately how long is Spirit of Norfolk Cruises Near Williamsburg, VA? The lunch and brunch cruises last 2 hours, and the dinner cruise lasts approximately 2.5 hours. How many decks or levels are there aboard the Spirit of Norfolk Cruises Near Williamsburg, VA? There are three levels on the boat. What lake or river does the Spirit of Norfolk Cruises Near Williamsburg, VA cruise on? Dinner Cruise: Casually Stylish. T-shirts, casual jeans, shorts, and sneakers are strongly discouraged. The cruise was enjoyable and the food was delicious. "We really enjoyed the cruise." We really enjoyed the cruise. The food was excellent and the entertainment was very good. We want to go again sometime. Cruise was beyond out expectations. Loved every minute of it. Wonderful service, excellent food, dj jerry was great!!! Very smooth ride and we will do it again!! !